LONG BEACH — Don’t let it be said that the local Cal 25 racers are not serious sailors. On the morning of Nov. 6, the Cal 25 Fleet V Championship dawned cold and rainy — but the racers all came out and put on a closely fought show, ending the day with Art Melendres’ One Time as the winner on a tie-breaker. The first race of the day, the wind was a moderate 10-11 knots, but coming from the wrong direction … off the beach at Belmont Shore, which is about 180 degrees from its normal southwesterly direction. It was not that big of a challenge for the race committee, but for the sailors, local knowledge and local experience was thrown overboard. But when the rain quit and the skies cleared the wind clocked around to its normal direction for the last two races of the day and settled in at 9-11 knots. “We had three completely different races,” Melendres said, “with three different winners … and it came down to a tie breaker in the last race. That’s pretty competitive racing. Second place honors went to Bob Daniel and his boat, Nemesis. “I love the one-design aspect of racing in the Cal 25 fleet,” Daniel said. At the end of the day’s racing, there was a tie for first and only one point behind was Nemesis. 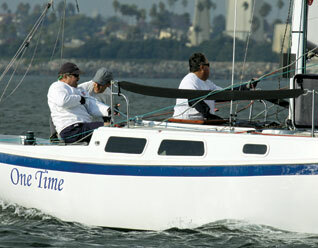 Rick Sottile and Felix Basadre finished in third place with their co-owned Cal 25, Tiburon. “It was a lot of work and strategy to outmaneuver the rain and wind today,” Sottile said. “It took a lot of extra skill to find the wind lines. Putting a winning team together was a family matter on One Time. Melendres gave credit to his son, Scott Melendres, and daughter, Monica Ouiedo. “I owe this win to the fact that I have a great tactician (Scott) and a great driver (Monica),” Melendres said. “The team never quit. Final Results are: 1st: One Time, Art Melendres, Long Beach YC, 4-2-1, 7 points on tie-breaker; 2nd: Nemesis, Bob Daniel, Alamitos Bay YC, 1-3-3, 7; 3rd: Tiburon, Felix Basadre/Rick Sottile, Seal Beach YC, 5-1-2, 8; 4th: Rhyme N Reason, Don Reiman, Alamitos Bay YC, 2-4-4, 10; 5th: The Iguana, Dennis Diem, Long Beach YC, 3-5-5, 13.